The amount of proteins inside cells fluctuate over time and this affects various functions of the cells themselves. Cells are constantly synthesizing and degrading proteins, and studies have shown that this "see-saw" actually impacts the function of the cell itself. 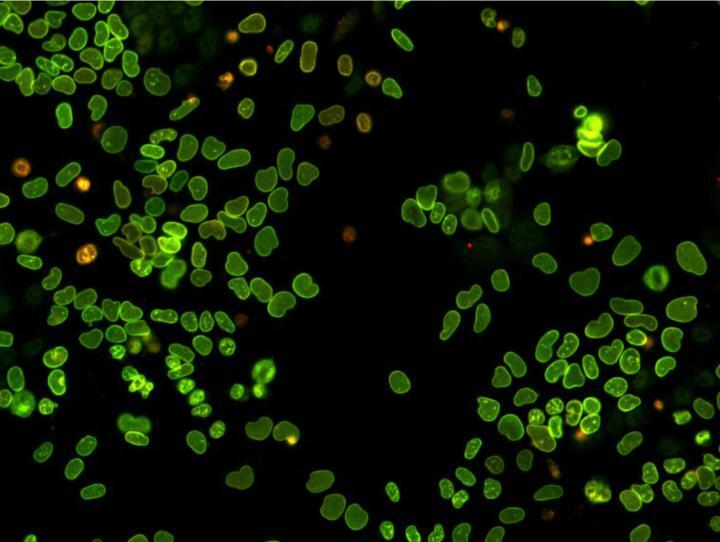 When it comes to stem cells, the constant variation of transcription factors (proteins that regulate the expression of genes) has important consequences on their ability to differentiate into mature cells. But what we don't know is how protein synthesis and degradation work together to regulate these fluctuations is not known. The lab of David Suter at EPFL, in collaboration with the team of Félix Naef has now developed a new method that can distinguish changes in protein synthesis from changes in protein degradation in single living cells. The method, published in Molecular Cell, uses a fluorescent timer combined with pulse-chase fluorescent labelling, which is a technique that can track a cellular process occurring over time. Using their new method, the scientists made two discoveries. First, that protein synthesis and degradation rates change significantly during the cell cycle, with almost half of them stopping to be degraded during mitosis. The second discovery was that protein degradation rates differ largely between individual cells. This variability affects all proteins to a similar extent, suggesting fluctuations in the activity of proteasomes – the protein complexes that degrade unneeded or damaged proteins. Remarkably, these differences are offset by corresponding changes in protein synthesis rates, thereby allowing to minimize variability in protein expression levels between cells. "Think of it as two factories," explains David Suter. "Factory A makes a lot of bad quality product X, meaning they are quickly out of order. Factory B makes less of high-quality product Y, which works for a longer period of time."